At least nine people have died, including two children who were crushed inside a car in Angelina County, Texas, as a result of severe storms that ripped through the South over the weekend, according to The Associated Press. The latest death occurred early Monday morning in Stafford, Virginia, where a 78-year-old woman became pinned underneath a tree that fell on her home, ABC affiliate WJLA reported. The woman and an 82-year-old man were sleeping when the tree fell. The man was transported to a local hospital with non-life threatening injuries. Two people, including a 13-year-old, died in floodwaters Saturday near Ouachita Parish, Louisiana, the AP reported. The teen died during flash flooding in the community of Bawcomville, near Monroe, and was pulled from a drainage canal, according to reports. In Alabama, a county employee was struck by a vehicle early Sunday as he was helping to clear downed trees near Birmingham, according to the AP. One person died overnight in Monroe County, Mississippi, as a reported tornado ripped through Hamilton, about 45 miles northeast of the campus of Mississippi State University. In Alto, Texas, 25 people attending a field day were transported to a local hospital with injuries. In nearby Caddo Mound, one woman died when a tornado ripped through a Native American cultural festival. In Houston County, the sheriff's office told the AP another person was killed in a nearby town. Around 2:15 p.m. Saturday, the Angelina County Sheriff's Department in east Texas received a call about a tree that fell on a car where two children, ages 3 and 8, were trapped in the back seat. A rescue team with the local fire department was able to remove the kids but they were pronounced dead on the scene, police said. A strong line of thunderstorms brought damaging wind gusts for much of the east Sunday night into Monday morning, with tornado watches in effect from the Florida Panhandle to southern Ohio. Gusty thunderstorms impacted residents from Washington, D.C., to New York City between 2 a.m. and 6 a.m., bringing flash flooding to some urban areas. Wind gusts topped 72 mph in Outer Banks, North Carolina, 71 mph near Norfolk, Virginia, and 63 mph in Provincetown, Massachusetts. The storm left 15,000 without power in Massachusetts and delayed the start of the Boston marathon. The Midwest experienced some extreme weather as well, with a blast of spring snow -- 5 to 9 inches in some areas -- impacting locations from Montana to Illinois and Michigan. The severe weather outbreak began Saturday morning in parts of the South with reports of large hail in Texas, Louisiana and Mississippi. Twenty-one tornadoes were reported across Texas, Louisiana, Mississippi, Alabama and Ohio. 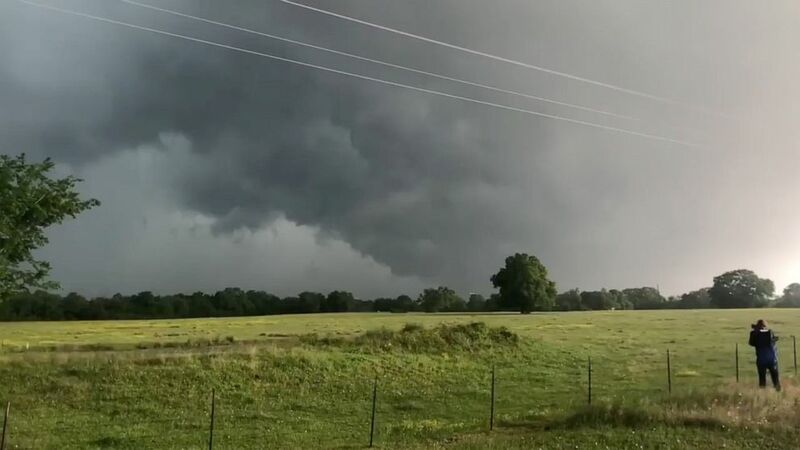 Overall, 428 instances of damaging weather, which also included damaging wind gusts and large hail, were reported from Texas to Connecticut. An EF-3 tornado with winds up to 140 mph was confirmed in Robertson County, Texas, over the weekend. Two more tornadoes -- one an EF-2 and another an EF-3 -- were confirmed in Cherokee County, Texas. More than 150,000 customers were without power across five states -- Texas, Missouri, Mississippi, Alabama and Louisiana -- on Sunday morning. ABC News' Max Golembo, Daniel Manzo and Daniel Peck contributed to this report.